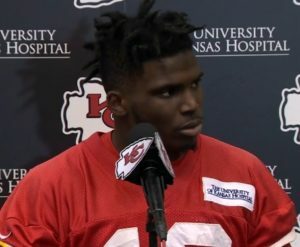 Kansas City Chiefs rookie wide receiver Tyreek Hill has been named the AFC Special Teams Player of the Week for his Week 14 game against the Oakland Raiders. Hill had a 78-yard punt return touchdown to give the Chiefs a 21-3 lead late in the second half. Hill had seven returns in the game, six on the punt team and one on kickoff return. Hill finished with 190 all-purpose yards in the game. He also had a 36-yard touchdown pass early in the second quarter. The award marks the second weekly honor for Hill in the past three weeks. He was named the AFC Offensive Player of the Week for his Week 12 game against the Denver Broncos. Hill enters Week 15 leading all punt returners in total yards (473) and punt return average (15.3). Hill is the first NFL player to win offensive and special teams player of the week honors since Reggie Bush in 2006. “I gotta give a shout out to my brothers, fightin’ for me…blocking for me” said Hill after practice on Wednesday. Hill talks about the time he realized he was faster than most people. He was six years old.